Get a team of 8-12 people connected and up to speed in a week, 24 in two weeks, 30 in three weeks — while never having more than 7 people in any group. Build a healthy team of 100 people with just one hierarchy level within 6 weeks. Note that only the 8-12 structure is built on experiments. The others are theoretical considerations which will need to be adapted to the challenges of large operations. Every team member should have worked with every other person at least once. Stable subgroups have a mentor-trainee structure: One more experienced person with up to two beginners. For large teams: Start with a group of people who become mentors and trainers for the others. Small teams up to 7 people simply train together. They all know each other. As first step, call for 6 volunteers. They do one session together where they learn the basics of the task for which you are building the team, as well as how to do the training. At least four of the six volunteers will become mentors in the next step. If you have 10 or more people to train (including the volunteers), up to two people can decide to get working instantly instead of taking part in further training. For example they can prepare the infrastructure for the others. In the second step, the team is split in four subgroups. In each of the next 3 sessions, the four groups are joined in different ways into two larger groups, ensuring that each group worked with each other group after 3 sessions. Let’s call the groups A, B, C and D.
Each of the sessions for each group is organized by one of the mentors, with the overall trainer providing materials and support. For example the two groups in session 1 could be organized by the mentor from subgroup A and by the mentor from subgroup C. For session 2 the mentor from A and the mentor from B could organize. And in session 3 organization could be done by the mentor from D and the mentor from C.
After these three sessions, every person worked with every other person at least once, and each of the four subgroups stayed together during all of the second step. And within each subgroup, there’s a mentor-trainee structure, since one person in each subgroup already got the training in the first step. The mentors solidify their knowledge in the sessions they run by teaching part of what they learned before. If during your training non-mentors want to switch subgroups, just add them to the other group. Only exchange in both directions if one of the subgroups would have only one person left. Best avoid showing people their group. Instead always assign by name to avoid fostering competition during the training. As with 8-12 people the training is run in two steps. In the first step, 7 volunteers do one session together. These volunteers become mentors for the others. In the second step, the team is split into 6 subgroups with 2 to 3 people, each with at least one of the volunteers from the first step (in addition to 1-2 beginners). One of the groups can work without mentor, because the groups will be combined. As first step, call for 7 volunteers. They do one session together where they learn the basics of the task for which you are building the team, as well as how to do the training. At least 3 of the 7 volunteers must become mentors in the next step, ideally 6 should become trainers. If you have 14 or more people to train (including the volunteers), up to two people can decide to get working instantly instead of taking part in further training. For example they can prepare the infrastructure for the others. In the second step, the team is split in 6 subgroups. In each of the next 5 sessions, the 6 groups are joined in different ways into 3 larger groups, ensuring that each group worked with each other group after 5 sessions. This step requires at least 3 mentors from the first step. It should have 6 mentors. Let’s call them A, B, C, D, E and F. The mentors are assigned to the groups in the order A,C,E,B,D,F. If there are 4 or less mentors, one group in step 2 will be run by the trainer. If there are only 3 mentors, step 3 and 4 will both also have one group run by the trainer (marked highlighted). This works just like the training for 8-12 people, but with the grouping shown below. This training works like the 12 to 18 people step, but if there are 6 or less mentors, some steps will need the trainer to run one of the groups. Step 1 will be the same as for 12 to 18 people, but with 7 volunteers. Step 2 must get at least 4 mentors, it should get 7. Assign the mentors in order A,C,E,G,B,D,F,H. Training up to 30 people so everyone worked with everyone else in the group takes three steps. See 2. At least 3 of these must become mentors for the next step. To avoid requiring trainer-run sessions, at least 5 of these should become mentors (up to 6). See 4. At least 8 of these must become mentors for the next step. To avoid requiring trainer-run sessions, at least 9 should become mentors (up to 10). This step can be done with 8 to 12 people and only 3 sessions instead (see 3), but might then require making all participants mentors. Putting all of these together, you can go one step further and start an organization which is as well-connected as possible with the least possible resources and time. Train 5 to 7 people. At least 4 of these become mentors for the next step. 1 to 3 people can start working right away and prepare the workplace for others. See 2 (1 session). Train 16 to 24 people. See 5. 15 of these will split in 3 sub-groups (5 people each)3 and act as mentors for the next step. These must be able to work without a trainer. 1 to 9 people can join the 1 to 3 from step 1 in preparing the workplace (7 sessions). Train 3 to 7 people (at least 1 person per sub-group) to be able to act as trainer (1 session). Train three sub-groups of 12 to 18 people each. See 4. From each group at least 7 mentors and one trainer will be needed for the next step. 5 to 11 people per sub-group can start preparing the sub-group workplace (5 sessions). Train three sub-groups of 20 to 30 people. See 6 (9 sessions). At this point you have an organization of 77 to 135 people with an administration group whose members have all worked with at least one person from every group. After step 2 there are 1 to 9 people who already work and who know all the mentors for the subgroups. If these take over organizatorial duties, every sub-group will have members who know the organizatorial group. If you take one day per session, this training will take about 6 weeks. 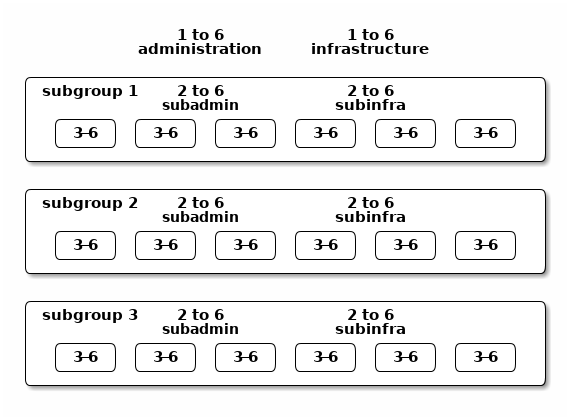 If you split each of the sub-groups around 6 workgroups with 5 members each, so each group can work well and grow or shrink by 30% if needed, and split people who started the initial preparation into an administrative and an infrastructure group, you’ll have a structure which looks similar to Figure 1. Figure 1: Organizational structure for 77 to 135 people with one hierarchy level. To scale this higher, you can continue after the last step of 7. 15 people in each of the three sub-groups split again into three sub-sub-groups each (5 people each) and act as mentors for the next step. These must be able to work without a trainer. 5 to 15 people can prepare a secondary administration tier. Train three times three sub-sub-groups of 12 to 18 people. See 4 (5 sessions). Now there are 140 to 252 people in three levels. You can still roughly double the size by having 5 to 11 people from each of the sub-sub groups train three times three sub-sub-groups of 20 to 30 people. See 6 (9 sessions). This article provides the tools to build strongly connected teams of up to 30 people — teams where everyone has worked with everyone else while group sizes never increased beyond seven. In 7 and 8 the article provides additional tools to build larger groups by using organization groups (administration and infrastructure) as centralized connection between the subgroups. The number 7 stems from George A. Miller (1956), The Magical Number Seven, Plus or Minus Two: Some Limits on our Capacity for Processing Information, published in Psychological Review, 63, 81-97. This structure was devised originally for scaling roleplaying weekends from 6 to 12 people while still ensuring that everyone played with everyone else at least once. The groups need 5 mentors instead of the 3 from 4, because there will not be a trainer.